Book and photo courtesy of Boice Lydell. Commentary by Paul Jackson. This book measures 10 3/8" x 8 3/8" and has 82 pages. The text body is set in ATF Satanick and was printed on Imperial Japan Vellum for the 3/4 leather edition of 100 and Roycroft handmade paper for the regular edition bound in paper over boards with a suede spine. 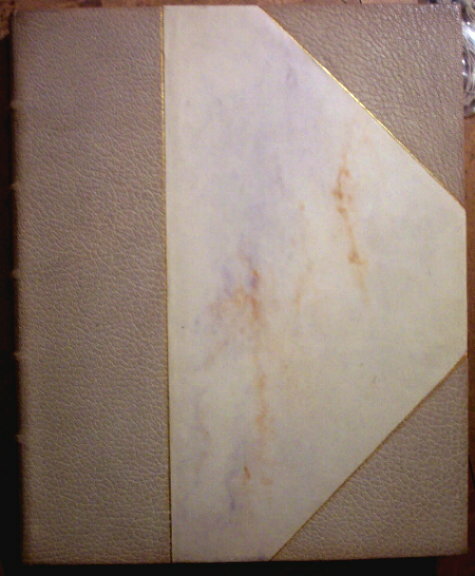 There is also a 1/2 suede Alisha binding nit noted in McKenna. Jerome Connor designed the title page and decorations and the Typography was by Andrew Andrews.